Coming to the shores of Biscayne Bay is a new standard in luxury residences. Auberge Residences & Spa Miami will bring an artistic edge to its beautiful exterior, and will surely become a staple of Miami’s art district for years to come. Scheduled for completion in 2019, this 60-story, 380 unit project from the Related Group brings decades of South Florida Development and design experience to the table. 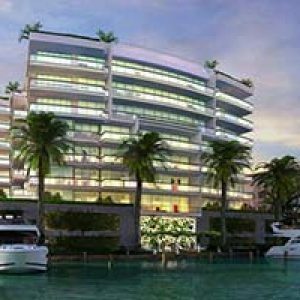 Designed by architects at Arquitectonica with interior designs by Piero Lissoni, Auberge Residences & Spa aim to create a home conceived in harmony with its surroundings, the beautiful Biscayne Bay. Floorplans are available from one to four bedrooms, and almost all luxury residences at Auberge will feature scenic bay, city, and ocean views. All floor plans at Auberge Miami Residences will feature open and contemporary floor plans. Private elevator entrance is provided with biometric security access. High ceilings don the living areas and range from nine to twelve feet, depending on the floor plan. Energy efficient, tinted, impact-resistant glass lines every residence floor to ceiling, including sliding glass doors that lead to spacious wrap-around terraces. The entire building will be pre-wired for smart home technology, taking advantage of the latest developments in wireless, biometrics, and amenity-control technology. Residents will be able to access concierge, security, and anything electronic in their home with a touch of a button. Kitchens will have a contemporary feel inspired by Italcraft, and will come equipped with a SubZero refrigerator and Wolf appliances. Bathrooms will be home to premium European cabinetry, imported porcelain flooring, and designer faucets. In addition to the top of the line amenities inside of your home at Auberge Residences, all community members may enjoy the full service spa and amenities provided for guests. The 60th floor rooftop pool deck is a great place to soak up the sun, enjoy full time food and beverage service, or relax in one of many private cabanas. Artwork from famed Miami artists Jaume Plensa, Fernando Botera, and Julio Le Parc decorate the spacious lobby and hallways of Auberge Miami. Work out in the state of the art fitness center, entertain guests in one of the many lounge areas, or get some work done in the library or business center. Auberge Miami has everything you need to live the lifestyle you dream. In accordance with designer Piero Lissoni’s vision, Auberge Miami will maintain an artistic feel to match the art attractions available in the neighborhood. Located at 1225 Biscayne Boulevard, Auberge Miami is walking distance to the Adrienne Arsht Center for the Performing Arts, Knight Concert Hall, and Miami International University of Art & Design. Also situated a few blocks from the A1A and I-395, Auberge Miami Residences provides easy access to downtown Miami, Miami Beach, and many other vibrant South Florida communities. Don’t miss out on this opportunity to own the most elegantly designed and luxury-driven residences in Miami!